Went into town with Tamra and had breakfast at the Corner Cafe (1000 Madison St.), great food and staff. Walking down to the gathering I came across this view and went back to sketch it after the morning meetup. Our daughter had a music performance at CWU (Ellensburg) that afternoon, so getting back for the afternoon sharing wasn't possible. Pen & ink with a watercolor wash in a Moleskine watercolor sketchbook. I was tempted to sketch the construction site where Bauhaus Coffee use to be. 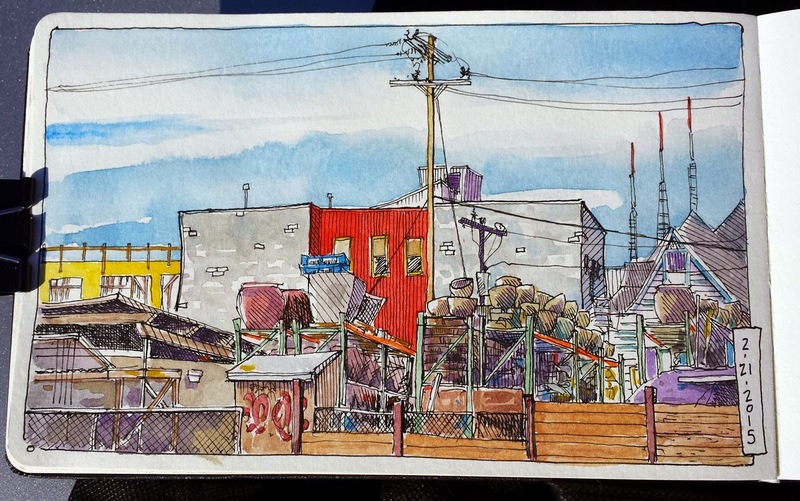 I like the orderliness of this sketch, and the colors.